My kids are at an age where they absolutely love theme parks, the excitement of visiting a new one and getting to explore the different rides and entertainment on offer makes their little eyes light up, and Ed and I are keen to visit the different attractions on offer around the UK. Trips to theme parks aren’t cheap though, so I was very excited when attraction ticket discount site 365 Tickets got in touch offering to send myself, Ed and the kids to Alton Towers for the day. 365 Tickets offer fantastic discounts on tickets to a huge range of theme parks and tourist attractions not only in the UK but internationally as well, including Disneyland Paris. Alton Towers is around a four hour drive from us, so we set off nice and early in the morning, arriving just after the park opened at 10am. 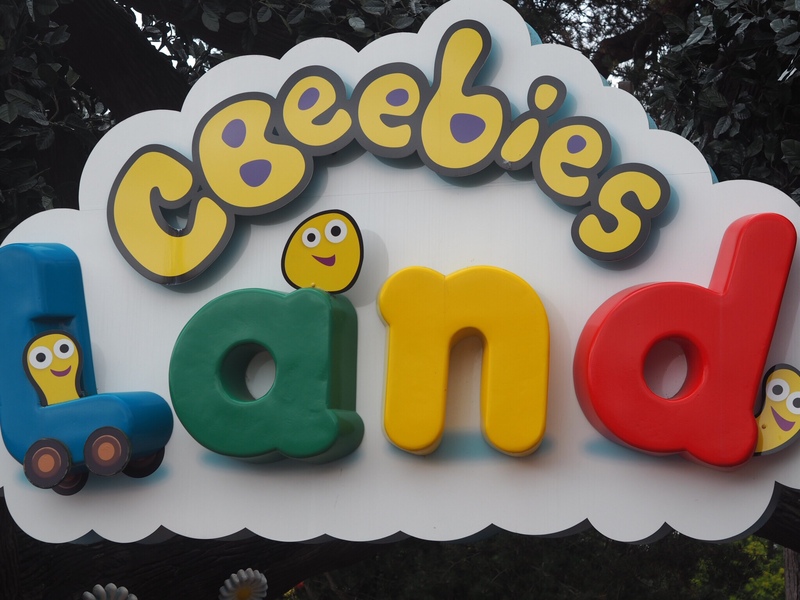 We were keen to explore CBeebies Land, as the children are all quite young still, and most rides were suitable even for Benjamin at 22 months old. CBeebies Land is located close to the entrance of the main theme park, and you can see the bright, colourful entrance straight away. The children were so excited to look around and we headed straight to the In the Night Garden magical boat ride as Benjamin has really gotten into watching it recently. The queues were quite long, as is to be excepted really when going in the school summer holidays, and we waited for between 10-60 minutes for rides in the CBeebies Land park. I thought it was good that on some of the rides there were things to keep the kids occupied in the queues. One of the children’s favourites was Postman Pat Parcel Post, which allowed them to sit and ‘steer’ the vehicle around the village, past characters from the show. They also loved the interactive Charlie and Lola’s house, which allows you to dress up the characters, and has a ball pit inside. After a few rides we were feeling pretty hungry, so we headed to the Little Explorers Lunch Box, where we took advantage of their meal deal and got paninis and garlic bread for us and rolls and the salad bar for the kids, along with drinks. I wasn’t keen on my food, the panini was very dry and the garlic bread was quite cold and hard. The kids enjoyed their rolls though, and the salad bar was excellent, with pasta, sweetcorn, peppers, cucumber sticks, pineapple, grapes and breadsticks. Next we headed to the Furchester Hotel show, which is on at half hour intervals throughout the day. We managed to get to the front of the queue and sat right in front of the action. It was actually a really entertaining show, and we all enjoyed it. We also visited Mr Bloom’s allotment, where an immersive show for small groups is performed at intervals. I highly recommend this one as it allows the children to really get involved and Carly in particular loved it! Before leaving CBeebies Land, we tried out shooting soft balls in Justin’s House Pie-O-Matic Factory, which was actually pretty violent – I got hit in the throat, and explored the Something Special Sensory Garden. We also travelled high above the park on the Get Set Go Treetop Adventure. It was probably the closest I will get to a rollercoaster anytime soon as I am a total wimp! We went into the main park, where Ed made a beeline for Oblivion, his favourite ride from when he visited a few years ago. There was no way in hell I was going on it, it looked terrifying! I managed to get a couple of shots of the ride when Ed was on it, and if you zoom in you can see the fleeting look of terror in his eyes as the ride stops briefly before its vertical drop. Unfortunately we didn’t have enough time to go on a lot of the rides in the main park, as we had spent so long in CBeebies Land, but Ed managed to get on the Congo River Rapids with Carly before the park closed at 6pm. The new Wicker Man ride had queues of around 75 minutes for the majority of the day, and then closed for maintenance shortly before the end of the day, but lets face it, I wouldn’t have had the guts to go on it anyway. I did like the design of the ride, and the theming in that area of the park, there was even a themed bar, which I stopped and had a drink at whilst the boys and I waited for Ed and Carly. There are plenty of shops around both parks, selling themed toys and souvenirs, and we treated the children as well as filling a big bucket with pick and mix sweets (I actually thought it was quite good value at £6, as there was a huge amount inside). It was a lovely, if slightly exhausting, day out and I wouldn’t hesitate in going back another time as there was a lot we didn’t do. If you are considering a visit to Alton Towers, I would definitely recommend taking a look at the 365 Tickets site as they often offer discounted prices and deals for both one and two day passes. 365 Tickets provided us with complimentary day tickets to Alton Towers for the purpose of this post, however all opinions and images are my own.